South Kerry is not only beautiful, but steeped in history. In fact, there are so many places to visit within one hour of Westcove that our visitors are 'spoiled for choice!' I have recently updated the list of the excursions I would strongly recommend to our visitors. As there are now so many links on-line for every attraction, I have tried to select the most informative ones to save you valuable time when planning your outings! 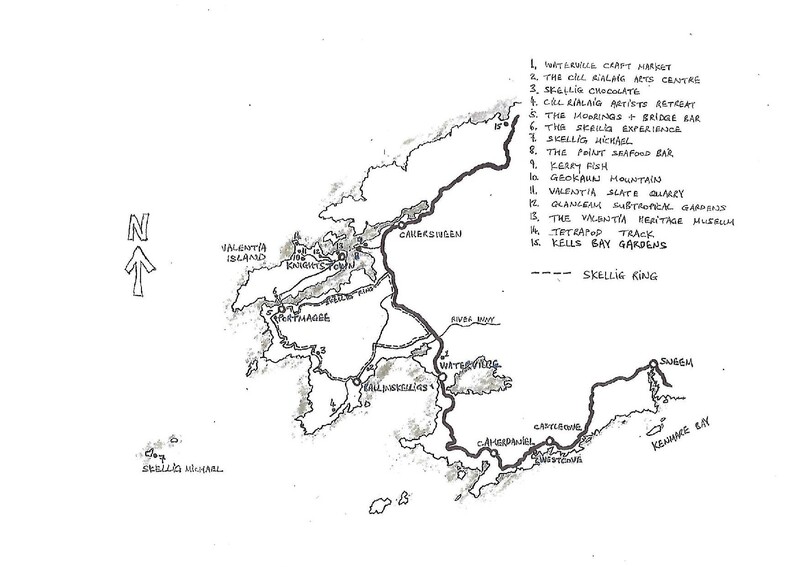 The following suggested day trips are mostly on - or easily approachable from -The Ring of Kerry itself, but if you are determined to drive the full circular route in one day, do consider one of our super 'tour guides'...especially if you are with a large group. Excursions The excursions below are our favourite local day trips; there is a sketch map to accompany each one. Click here for a larger scale sketch map of the area around Westcove. If you drive on past the riding centre, you eventually get to a pretty little natural harbour. You can park there and walk up the hills or out to an unspoilt rocky shoreline - especially dramatic in heavy storms! When walking over any local hills, always watch out for slippery rocks and unexpected boggy patches. and please keep dogs on leads if there are sheep about. In Caherdaniel itself - go to The Blind Piper - a young atmosphere and serving excellent food from 12.30 - last orders about 8pm. Don't miss their live music sessions at about 9pm on Thursday evenings throughout the year! In summer, there's a very lively market in the village hall between 10 and 12 on Friday mornings - well worth a visit - lots of local produce, arts and crafts. Derrynane... 2k from Caherdaniel Turn left towards Waterville and then left again at Caherdaniel … lots of possibilities … If you just want a stroll along the dunes (dogs paradise with endless rabbit burrows) turn left (under 5'9" barrier) just as you get to a fork in the road … go straight on to visit Derrynane House - a fascinating insight into Irish history - the house of Daniel O'Connell, "The Liberator" the house and gardens are well worth a tour - I've seen the 25 minute video at least 10 times and am still intrigued ...and in summer the tea rooms have an irresistible selection of home-made cakes. Continue on towards the coast and at the end you get to a Car Park. On the left is a very good, sheltered beach for swimming/sunbathing (?!). 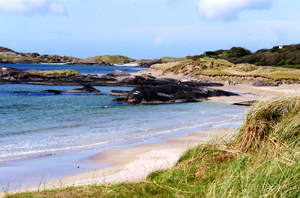 On the right is an attractive little harbour where Helen Wilson and other qualified instructors at Derrynane Sea Sports provide facilities within a fine, sheltered area for windsurfing, waterskiing and sailing - with small 'canoes' for younger children. In low tide well worth a stroll over to Abbey Island - ruins of a very old abbey and lovely views across the sweep of Derrynane Bay. On the way back, why not call in at Keatings Bar on the left? Bridie will give you a warm welcome...her crab - and lamb and mint - sandwiches are as legendary as she is! Sneem : 14.5k East of Westcove - 15-20 minutes drive away - is an exceptionally colourful village with a very pretty river running through it and fun pubs. It has a small supermarket, an excellent butcher, a friendly and helpful chemist, a florist with a selection of Skellig chocolates.....the only 'minus' being being that it is also a very popular stop for the numerous Ring of Kerry tour buses...especially round mid-day in the summer! About a mile north of Sneem on the Killarney road is Blueberry Hill Farm - they offer an amazing variety of courses and activities for all ages ... I honestly can't remember 3 hours passing as quickly as they did when I took our 3 grandaughters on one of their Family Fun Tour a fabulous experience! Go through Waterville, and when you see the Butler Arms Hotel, take the left fork towards Cahersiveen. This takes you past The Waterville Craft Market on your right with an exceptionally good selection of woollen goods, pottery, interesting books and lots more. Shortly after crossing the bridge over the River Inny, turn left signed Ballinskelligs. Just before the village, look out for a round stone building on your left with a thatched roof. This is The Cill Rialaig Arts Centre, where you can browse through a fascinating collection of paintings, sculpture, ceramics, textiles, bog wood carvings - mostly the work of Irish artists but also featuring international painters and sculptors, many of whom have stayed at the inspiring Cill Rialaig Artists Retreat. In the village of Ballinskelligs, take a right turn signed 'Skellig Ring' and follow this very scenic route towards Port Magee. Six miles on, look out for the Skellig Chocolate Factory on your right....an essential stop for chocoholics! You can watch their truffles and other irresistible chocolates being made...(and taste before you buy! )...Although closed in January they are open the rest of the year from 10-5 on weekdays and also at weekends in July and August from 12-5. The road then winds its way up to the top of a hill, with magnificent views over The Skelligs, Valentia Island and beyond, before descending to Port Magee with its colourful array of fishing boats lined up along the quay ...why not stop here for great 'pub grub' at The Bridge Bar or a more formal meal at The Moorings restaurant next door ? A visit to The Skellig Experience is an absolute must ! This is an excellent visitor's centre - on the left just over the bridge linking Port Magee to Valentia Island. Watching their 25 minute video, shown regularly throughout the day, is the next best thing to actually landing on Skellig Michael itself and climbing the 700 steps to the monastic settlement -( the location for the final scene of the latest Star Wars !) They also offer a wonderful2 hour cruise around both islands (again, weather dependant). At this point, you have 3 options!. Option 3 :- Energy, time - and weather - permitting, you could spend another 2-4 hours exploring Valentia Island itself... I suggest you visit valentiaisland.ie and click on their 'visitor attraction' link... depending on your interests, the following are the ones I would recommend:- Geokaun Mountain: Walk or drive to the summit of Geokaun Mountain on the north east of the Island, which on a clear day affords spectacular 360 degree views over the surrounding mountains and the Atlantic as far as the eye can see. There is a picnic area and 50 info plaques on the mythology, history, fauna and geography of the region. Valentia Slate Quarry: Well worth visiting, not only to catch a glimpse of the skilled work taking place in the huge grotto - they have provided slate from the early 19th century for many great European buildings including the Houses of Parliament - but to admire the stunning views from its location on the coast, 2 miles from Knightstown. Glanleam Subtropical Gardens -also signed from Knightstown, is a wild garden with walks through exotic specimen trees and hydrangeas, opening out to vistas of the Lighthouse and the dramatic rocky shoreline of the Atlantic.... The Valentia Heritage Museum, . in Knightstown itself ... exhibits include the fascinating account of how the very first transatlantic cable station was laid in the mid 19th century between Newfoundland in Canada and Valentia Island- the westernmost point of Europe! Tetrapod Track :- This Trackway, as the name suggests, comprises the fossilised footprints of a 380 million year old tetrapod - here is the best, most thought provoking link I can find on this fascinating subject! Kells Bay Gardens, known locally as 'The Jewel on the Ring', cover 17 hectares (42 acres) of spectacular topography with magnificent vistas over Dingle Bay and contain arguably the finest collection of Tree Ferns and other exotic 'southern hemisphere' plants in Europe. There are over 3km of walking routes taking you past Ireland's longest rope bridge, waterfalls and fascinating 'dinosaurs' and other wood sculptures carved out of fallen tree trunks - something for all ages and interests! Since 2016 the gardens have been owned by a world-renowned Irish dendrologist Billy Alexander under whose expert eye the gardens are constantly evolving . The Delligeenagh Cafe - open throughout the year - offers a good variety of food, from light snacks to interesting Thai dishes. The more formal and highly praised Sala Thai restaurant, run by the owner's wife, is open for lunch and dinner during the summer months. From Caherciveen follow the N70 - 'Ring of Kerry' road - towards Killorglin. Ignore the 1st sign to Kells, (a long narrow road with no passing places), and 3 miles on - about 15 minutes drive from Cahersiveen - turn left opposite Kells Post Office on the L7520 road signed 'Kells'.... shortly after you will find the magical Kells Bay Gardens , which are open all the year round. For further information. please visit their excellent comprehensive website! Although you need to set off early and do quite a lot of driving, the following day trip has always been really popular with our guests - especially those who appreciate beautiful scenery and gardens. Drive to Kenmare (about 45 minutes from Westcove). This town has so much to offer - especially on a Wednesday when it boasts a lively street market.You could spend a whole day there, lunching at The Purple Heather and browsing the excellent selection of shops , but if you've set out to visit the Beara Peninsula, don't linger as you'll run out of time! At the top of the wide one-way street turn right, and then left at the 'T' junction signed Glengarriff/Bantry . 3 miles before Glengarriff, as you descend the spectacular mountain pass is The Ewe Sculpture Park - a unique, quirky experience for all ages, open June - August - good descriptions on 5* 'tripadvisor' reviews! Glengarriff has some good pubs, but on a sunny day between June and October - do take a little 'ferry' to the beautiful 'Italian' Garden on 'Garnish Island' - boats leave regularly from the main pier at Glengarriff. The walk around the well signed garden trail takes about 1 hour - quite hilly in parts but an absolute 'must' for garden lovers! There is a good snack bar on the island, just as you disembark from the ferry. As you continue along the A71coast road towards Bantry you will see the entrance to The Bamboo Park - a huge Japanese style gate on your left...a must for plant lovers! 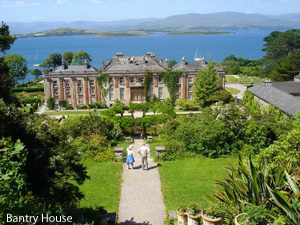 Bantry House and Gardens are about 20 minutes on from Glengarriff . This is a stunning stately home overlooking Bantry Bay which has been lovingly restored over the past ten years - wonderful furniture and paintings and very colourful gardens. Derreen Gardens is another must for garden lovers. This wild coastal garden, situated near Lauragh, 25 minutes from Kenmare along the south shore of the Kenmare Estuary, is mainly known for its stunning display of huge rhododendrons and azaleas - so really worth visiting between early April and mid June. If you do go there en route to Glengarriff, aim for Adrigole via the Healy Pass - another amazing mountain pass, full of hairpin bends, but with panoramic views over Bantry bay. Of course you may not have the time - (or energy!) - to visit all our suggestions above, especially if this is your only day to visit Kenmare, but hopefully the above information gives you an idea of what's on offer on the fascinating Beara Peninsula. "How can you buy Killarney!? ".....This iconic Irish/American ballad was in many ways responsible for my father buying Westcove House. In 1961 our family were on a fishing holiday in Connemara... not a cloud in the sky, so hopeless for fishing.... "Let's do a tour of the famous 'Ring of Kerry' and visit Killarney, the town I've been singing about for so many years", said my father. We came across a 'for sale' sign pointing towards Westcove House - and the rest is history! Muckross House and Gardens - 2.5k on from the falls.. a house full of history with beautiful gardens, traditional farms, weaving, pottery, excellent restaurant and more! Muckross Abbey - The well-preserved ruins of a 15th Century Franciscan Friary only 5 minutes walk - or horse and buggy ride - from Muckross House car park. The Killarney Falconry ... 'provides group and private hawk walks for all ages... set off around Killarney's Lakelands to fly a hawk/hawks and experience the moment when a hawk scoops down to land on your gloved fist' .... The falconry is based 5 minutes north of the town centre, off theTralee road. See here for more info. Amazing reviews! The Gap of Dunloe... This famous mountain pass 'was carved out 2 million years ago by slow moving glacial ice'... You'll find signs to the entrance to the Gap at Beaufort 10k west of Killarney on the N72 Killorglin road. You can drive, walk or cycle through 'The Gap'... even hire a pony and trap... see here for the best info on all the possibilities! 'Dingle' is a household name when considering a visit to South West Ireland...It is a beautiful rocky peninsula with lovely long stretches of sandy beaches, but its main claim to fame is Fungi - the legendary Dingle dolphin . After 30 years, it seems he continues to make regular appearances in Dingle bay, and visitors still flock there to take a boat trip, hoping to catch sight of him! However, Dingle town is a good 3 hours drive from Westcove, on winding roads, so you'd have to set off very early in the morning to make this trip, and with so many other excursions to choose from with much less driving involved, I urge you to think carefully before embarking on this one!